DC NearlyWeds: I Found the ONE!!! So after months and months (and I do mean to emphasize as I've been stalking Theknot.com and Brides.com for over a year now!) 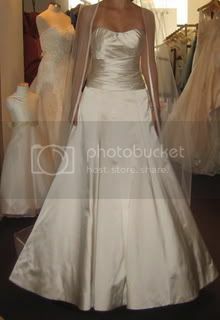 I've been dreaming about my perfect wedding gown. There was one that had stuck in my mind after I had tried it on during initial hunting but it didn't go with the theme I was pursuing then (traditional, ballroom-type atmosphere, peonies, etc.). The first time I referred to it (when I was 10lbs heavier), I called it the "straight-jacket" wedding gown, because it is banded with double bands that wrap around it and appear to tie in the back. During the winter months, I often thought about the straight-jacket gown and how beautiful it would look in candlelight. So you can imagine how eager I was to try it on again when I decided on a more modern approach with calla lilies as the flower of choice, in a candlelight-drenched room far from a typical ballroom! My sister (the maid of honor) drove in from NY for the day to help me pick my wedding gown. Now, THAT is dedication!! We spent over 3 hours and were there till closing trying on gowns... not me, though... her! After trying two others (after I already tried on the ONE) I was decided. I had made my mind up and there was no going back. I have not regretted the choice since. The straight-jacket it was, or better said, Melissa Sweet's Nicollete. So, in the meantime, my sister found the bridemaids gown. It's very simple and understated. 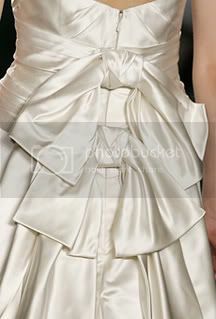 It is a long A-line gown with a double band that wraps around the top and has buttons down the back. Very elegant. We decided that she would wear chocolate brown and the other girls would wear toffee which is like a rich champagne/caramel type color that totally compliments the room we are having it in. So what if it is in August? Brown is such a striking color and very fashionable these days and who is going to tell me I can't choose those colors? The wedding police?!? Anyway, in any case, I learned a very very important lesson. If you wait till 4 months before the wedding to choose a gown, you will pay through the nose for it. 300 dollars to ship the gown and it will get here only THREE weeks before the wedding. No added pressure!! Plus, I was not happy to find that it costs 500 or upward to alter this thing. I am under 5 feet tall so it will certainly need alteration. All in all, I am very very pleased and I cannot wait until July 15 (my hubby's birthday) to see my beautiful gown and wear it again. I swear after the wedding, I'm going to wear it all around the house! Your original dress is beautiful - I can only imagine what the new dress looks like! And please, my color is chocolate brown and I'm in August - go with what makes you happy! Thanks so much! I LOVE chocolate brown! It's such a gorgeous contrast to ivory!